A cat once pursued a lion. “Ah,” said the lion, “Excellent.” And he ate her up, whiskers and all, with great delight. Tell us an original fable in exactly 33 words. The moral of this story is, of course: be careful what you wish for. This weekend’s challenge is community-judged. Please vote for mine! In order to vote, visit the Trifecta Writing Challenge website where stars will appear next to each link. To vote, simply click the star that corresponds with your favorite post. This entry was posted in Awards, Microstories, Writing and tagged 1st place, 33 words, apropos of nothing, microfiction, microstories, trifecta, trifextra. Bookmark the permalink. It feels like you told a full story with only 33 words! Now that’s talent! 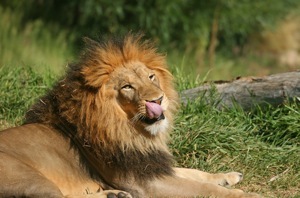 We lions are very fond of our food. Loved her deeply, loved her to death. Made me smile. Delicious tale. I thought my comment went through. Well…if you see two comments, toss one. Anyway, this was scrumptious! I lived it. Well written. BTW, I followed the discusion on which definition was required, but this one is classic. How could it not qualify? Moral of the story is beware of what you ask for! Perfect and scrumptious! The lion did exactly what was asked. He loved the cat, a little too much? Then probably licked his lips! Well, he must have really “loved” her! One of my favorites! Clever and easy to follow. Nice work! Elegant little fable! I couldn’t bring myself to figure out something that pithy in so little space. Fun! Reminds me of Free To Be You And Me, Ladies First piece.